The situation in Puerto Rico remains bad, however, an aid package passed through Congress today. The Washington Post reports an estimated 80% of the Puerto Rico power grid remains offline. Federal aid agencies are operating effectively according to personal acquaintances. We are doing what we can to help. 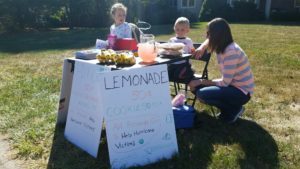 When our six year-old daughter learned about the hurricane, she decided to have a lemonade stand in support of hurricane victims. She raised well over $100, and many people donated sums beyond the cost of what was sold. Our thanks to everyone who stopped by for their generosity. 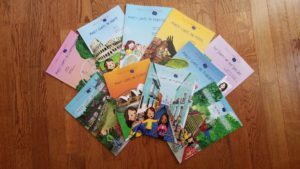 Amy and I also made the decision to donate all of our book earnings for October to hurricane relief. Please join us in this effort, whether through buying books or donating directly to an aid effort of your choice. The organization we chose is GlobalGiving, mainly because of the the transparency in the way they do things. It all goes to hurricane relief this month. We met many, many kind and generous people in Puerto Rico. When we ran into trouble, there were several offers of help that went beyond what anyone would expect. As I said elsewhere, after just a short time, you feel as if your among old friends. That is our enduring memory of the people of Puerto Rico, and it is our turn to help. Thanks to all who choose to donate or simply help by spreading the word.